I saw The Great Escape when I was about eleven years old, and I thought that “The Cooler King” was the coolest dude ever. He wasn’t the smartest or even toughest of the escapees, and he didn’t even manage to escape, but he was definitely the coolest. I had no idea who Steve McQueen was at the time (obviously), but the cooler king sure was cool. Best way to describe how he always had a way of effortlessly annoying his guards and staying alive. Everyone cites the scene in which, trapped between most of the German Army and a really high barb wire barricade, he goes for the barricade. But in my opinion, he is at his coolest when, captured at last, he pulls his dogtags out of his shirt, with a look that said “hah, you think you caught me spying, but I’m still a prisoner of war. I live another day.” His style matched his personality. 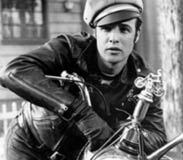 His leather aviator jacket and tee-shirt with slim, flat front khakis all stood in sharp contrast to the buttoned up Brits (although James Coburn was pretty cool too). And of course, the rode a great Triumph motorcycle to his near escape. Growing up in the 80’s, I was more interesting in being like Michael J. Fox than Steve McQueen, but even then, there was something about the man that made me know that the Corey’s (Haim and Feldman) could never be as wicked awesome as he was. What I didn’t know was that Steve McQueen, before he died, had accumulated a dozen lifetimes worth of coolness on the screen, as Vin in the Magnificent Seven, as The Cincinnatti Kid, as Thomas Crown, and pulling off that most difficult of things, the black turtleneck, as Bullitt. Of course, there are stylishly influential movies closer to the present as well, though dad generally disagrees that they are anywhere as cool. 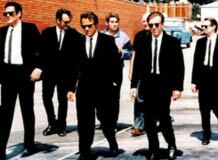 The Reservoir Dogs uniform of black suit, white shirt, black tie, is iconic. (Actually, all of the suits save one were vintage, meant to look a little sketchy, like the characters.) And we may be out of our temporary delusion now, and realize once again that Keanu Reeves is a huge wanker, but for year after The Matrix came out in theatres, leather trench coats, sunglasses and combat boots were not just for pimply year olds with frizzy ponytails and skin conditions. Tony Leung’s impeccable suits in In the Mood for Love, true to the styles worn in post War Hong Kong, nearly redeemed a film that some said was “highly nuanced”, which is apparently another way to describe “unendurably pretentious and dull.” Brad Pitt’s vintage leather jacket, sunglasses and bedhead in Fight Club spanned a generation of style that has now been co-opted by testosterone monsters from Jersey, something I’m sure keeps him up at nights. And of course, designer clothing and film can be inextricable. Of course, it is difficult to separate American Gigolo from Giorgio Armani. But “Beat” Takeshi Kitano’s films are outfitted by Yohji Yamamoto, and masterfully. His slightly oversized cuts and boxy silhouettes are perfect for Takeshi’s violent, archaic Yakuza characters. I think that style is actually a pretty good barometer for the quality of a movie. A movie with good style shows that the filmmaker has paid attention to detail, has considered every lighting angle, deliberately chosen the Attolini suit over the Gieves and Hawkes. At very least, you are not going to see the poorly basted pantlegs and obviously pinned shirts that you see in hastily put together fashion ad campaigns.